Charissa Brock has found her passion, inspiration, and ongoing challenge in the versatile plant. Published on Thursday, January 17, 2019. This article appears in the December/January 2019 issue of American Craft Magazine. The grace of bamboo makes it Charissa Brock’s primary material, but she also uses glass to add color and light to her work, as in the 9-foot-wide Allegro (2018). Since that day in 1999 near Philadelphia, Brock has continued the conversation with her muse. 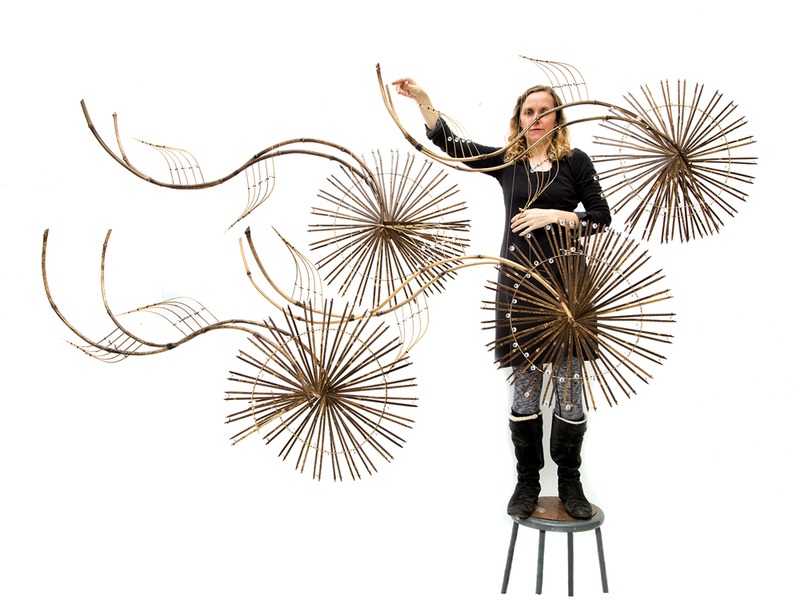 Now based in Portland, Oregon, she is entering her 20th year as a bamboo artist, making everything from jewelry and bowls to vessels, wall sculptures, and installations. She also teaches bamboo techniques to students who visit her 900-square-foot studio and in workshops around the country. She grew up in Albuquerque, New Mexico, where “art was just what we did,” says Brock, 47. Her parents sold their stained-glass work on the craft fair circuit until she was in her teens, when Habatat Gallery started representing her mother, Emily. Her sister, Kendra Grace Brock, is a fabric and clothing designer. Brock with Float (2018), which combines bamboo and glass. 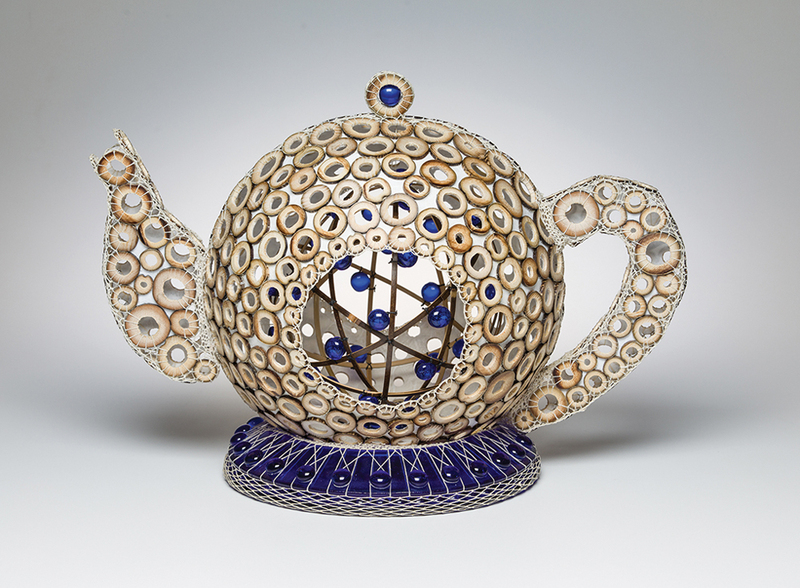 Tea With Edna, 2017, bamboo, cast paper, linen thread, glass, 11 x 15 x 8 in. 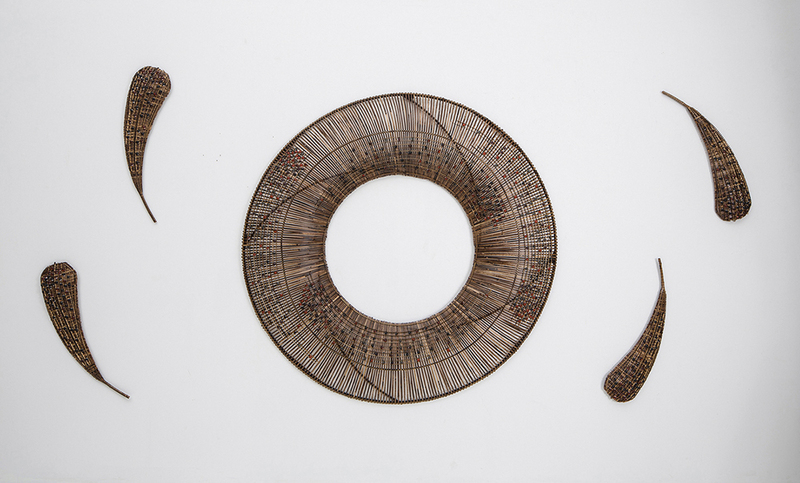 Fire Circle, 2016, black bamboo, glass, steel, linen thread, 6 x 8 x 4 ft.
After graduating in 2001, Brock moved to Portland for a residency at Oregon College of Art and Craft. “I didn’t even know if bamboo grew in Oregon, so I packed two refrigerator boxes filled with bamboo and shipped them there,” says Brock. 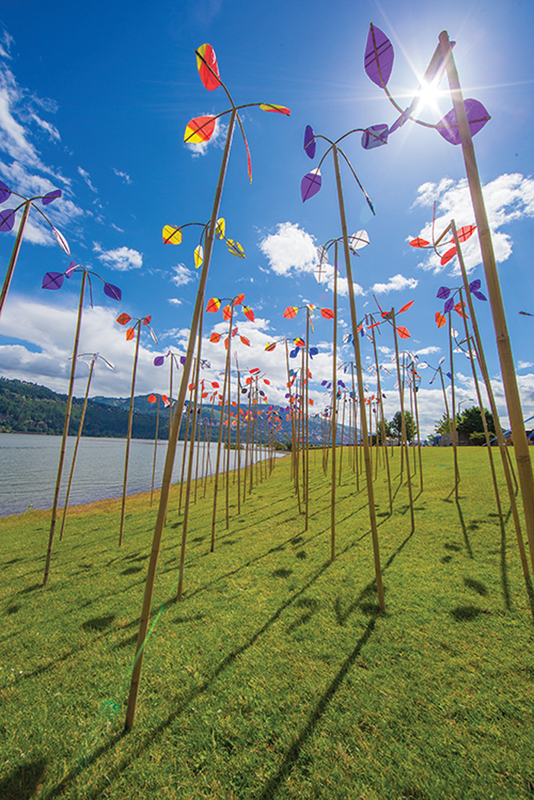 As it turned out, not only did bamboo flourish in Oregon, it had a community of enthusiasts who welcomed her. It also was home to two leaders in the field – the late Ned Jaquith, who started the 20-acre Bamboo Garden nursery outside of Portland, and basketmaker and sculptor Jiro Yonezawa (who has since returned to Japan). “Ned took me under his wing, giving me materials and sharing so much knowledge,” says Brock, who sometimes teaches at the nursery, which grows more than 300 species. Yonezawa taught her the tricks of the trade, including how to use a splitting knife developed specifically for bamboo and how to apply heat to bend the material. “Discovering new tools, techniques, and materials have been the catapults to my work,” she says. Brock favors black bamboo for its color and ease of splitting but uses several other species of the renewable plant, which spreads rapidly. Most of her material comes from groves within two hours of her home, and she’ll happily do the labor-intensive work of cleaning up and pruning a grove in exchange for the bounty. Some of Brock’s most recent work employs kiln-fired glass to add touches of color to graceful geometric wall sculptures. (She worked for a few years at Bullseye Glass Co. in Portland.) In the wall piece Allegro (2018), blue beads are woven into waves of black bamboo, while red petals extend gracefully from above and below. “I like that color creates an uplift in the work, and I’m also looking at things like attracting light and casting shadows,” she says. Brock is passionate about sharing her skills and knowledge of bamboo as an artistic and utilitarian material, and she dreams of opening a bamboo school at her studio. At the same time, she herself is continuing to learn, to reach further. “After almost 20 years in bamboo, I’m finding less of a gap between the ideas I have in my head and what ends up coming out in the physical work, so now I have more energy to focus on the conceptual aspects.” The bamboo is still talking. Charissa Brock will have a solo show at RiverSea Gallery in Astoria, Oregon, July 13 – August 6.